Build a rain gauge by cutting off the top third of the plastic bottle and inverting the top inside the bottom to form a funnel. Use a permanent marker to record inches on the side of the bottle. Explain that people who report on the weather need to know how much it rains each day. Introduce your rain gauge and have children brainstorm ways the class can use the tool to discover how MUCH it rains. Show them how a rain gauge works: Set the gauge in a pan and pour a pitcher of water into the gauge. Have the children observe the rain gauge. Extension: collect some rain in a bottle and put tap water in another bottle. Set out an assortment of beans, rice, and small manipulatives in containers. Ask parents for assistance in gathering enough toilet paper rolls or paper towel rolls for each child to make a rain stick. Have the children decorate the tubes with markers, crayons, fabric strips, collage materials, etc. Seal one end of the toilet paper roll with wax paper (doubled-over for strength), fabric, and a rubber band prior to setting out for the children. Have the children fill or spoon beans, rice, and/or small manipulatives (beads, shells, etc.) into the tubes until they are approximately two-thirds full. When done filling the tubes, help the children seal the final end of the tube with wax paper (again, doubled-over), fabric, and a rubber band. Extension: have the children listen for the different sounds they make. Is one rain stick softer or louder than the others? Do they really sound like rain or something else? 3) RECYCLE PLASTIC GROCERY BAGS into KITES! We made kites out of plastic grocery bags (the ones with handles). They are easy to make: Give each child a plastic bag and help them tie the handles together with a piece of long string or yarn, then staple streamers to the bottoms. The children can then fly them outdoors. 4) RECYCLE PLASTIC BOTTLES and make BOTTLED NATURE! You’ll need an empty plastic pop bottle, salt, items from nature (we used seeds and beans, small sticks, nuts, grass, etc. ), colored drawing chalk, paper plates, and a small funnel (if you do INSIDEâ?¦put a plastic tablecloth on the floor for easier clean-up.) Lay the tablecloth on the floor and give each child one paper plate. Pour salt in a thin layer on each child’s plate and let them choose one color of chalk. Have the children lay their chalk flat and use to rub the salt in up/down motions. The salt will take on the color of the chalk. When the salt is colored, have the children fold their plates carefully and pour the chalk into the Ball glass jar. Keep laying the colored salt from the other plates. Repeat the process until the bottle is 2/3’s full with layers from the children’s colored rubbings. Add the nature items to the chalk. You can do as many or as few bottles as you like and have time for. Set the bottles out and have the children shake and roll them to find all the different items. See if the children can find ALL of the items you inserted into the bottle. *Can also use these bottles for Holidays…inserting various miniture flags, turkeys, Christmas Trees, Easter Eggs, etc. We made a work page with a picture of each item inserted into the bottles and had the children circle the item(s) as they FOUND it! 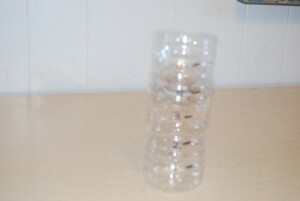 5) RECYCLE 2 LITER BOTTLES into TWISTERS! Take two bottles and fill ONE bottle 1/2 way full with water. Set upright on a table and place the 2nd bottle (neck to neck) on top of the other. Securely wrap duct tape around the joined necks of both bottles. Have the children swirl the water in the bottle and turn upside down. A funnel will form just like a real TORNADO! Every little bit helps…don’t be fooled by telling yourself that “I don’t make a difference!” We ALL do…one little piece at a time! « Help for Weekend Mornings!